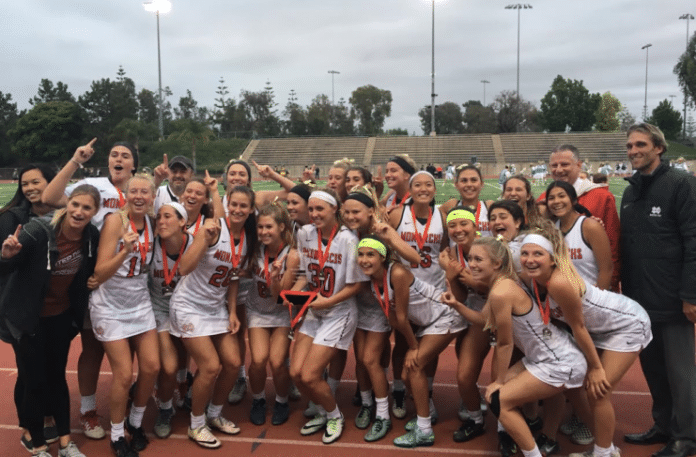 Irvine – Seniors Grace Houser and MacKenzie Wallevand combined for eight goals to lead the Mater Dei girls lacrosse team a 13-9 victory over Foothill in the U.S. Lacrosse Southern Section South Division championship game. It was the second year in row that Monarchs defeated the Knights for the South Division championship. The Monarchs (15-5) will play Redondo Union on Saturday at Palos Verdes High at 10 a.m. The Seahawks upset LA top-seeded Chaminade 14-7 at Mira Costa High. “Our saves weren’t quite there today, so we just had to go into holding and keeping them in the guessing game when we were going to stall and when we were going to go. We had game plans for both and luckily today the girls were listening and executed well,” Mater Dei Coach Cressita Bowman said. The high-scoring first half was characterized by a series of runs. Foothill went up 4-3 early in the first half, but Mater Dei responded with six unanswered goals to go up 9-4. The seasoned Knights never panicked and closed out the half with three consecutive goals of their own to go into into halftime only down 9-7. After Houser put Mater Dei up 10-7, Foothill got two goals from Ashley Stokes and Lauren Kilger to get Foothill to within 10-9 with 10:50 mark. But the Monarchs put their ball-control skills to work and played an effective game of keep away to keep Foothill off the scoreboard for the rest of the game. Goals from Houser and Payton Smith put the game out of reach. “I was happy to play Foothill again. I wasn’t timid, I was ready for them. I’ve been pumped for this all week since we’ve won Saturday. I’ve been ready to play,” Wallevand said. Houser led Mater Dei with five goals while Wallevand added three goals. Lauren Gonzales had two goals and Smith, Tess Keiser and Madi Hooks each had one goal. Goalie Courtney Walburger, who was celebrating her birthday, had three saves, but they were big ones. “They are powerhouses. You can’t wrap them up, they are a force to be reckoned, they are storms on the field, they demand attention,” Walburger said about Wallevand and Houser. Stokes led Foothill with three goals while Brooke Williams had two goals. Kilger, Sydney Boyd, Emma Gauhjran and Brie Ratkevich had a goal apiece while goalie Rebecca Nailon had eight saves, who also drew praise from Bowman. The Monarchs turn their attention to Saturday’s game where they will play Redondo Union for the Southern Section championship. The Monarchs are looking to be crowned Southern Section champions for the second straight year. “We have to stay focused and bring everything we have,” Houser said.